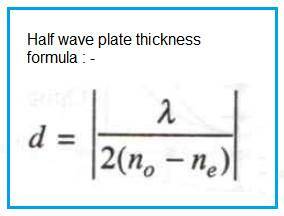 This page compares quarter wave plate vs half wave plate and mentions difference between quarter wave plate and half wave plate. 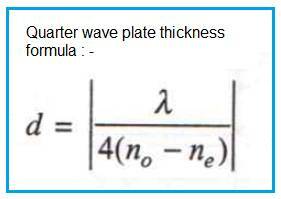 The formula or equations for quarter wave plate thickness and half wave plate thickness are also mentioned. The quarter wave and half wave plates are commonly used phase retardation components in fiber optic systems. Uniaxial crystal plate is made from calcite, KDP etc. When this plate is cut, then introduced phase difference (Δφ) between o-ray and e-ray during propagation is expressed as follows. Here o-ray stands for ordinary ray where as e-ray stands for extraordinary ray. Light passing through calcite crystal is split into two rays. This process, first reported by Erasmus Bartholinus in 1669. This is called as double refraction. For normal incidence (a 0o angle of incidence), law of Snell predicts that the angle of refraction will be 0o. In the case of double refraction of a normally incident ray of light, at least one of the two rays must violate Snell Law as we know it. For calcite, one of the two rays does indeed obey Snell Law; this ray is called the ordinary ray (or O-ray). The other ray (and any ray that does not obey Snell Law) is an extraordinary ray (or e-ray). In the expression, 'd' stands for thickness of the crystal plate. 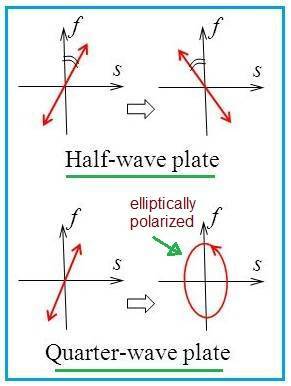 By selecting value of 'd', phase difference (Δφ) between two emerging plane polarized waves can be π/2 for quarter wave plate and it is π for half wave plate. The formula for thickness ('d') in both the cases are mentioned below. • It converts linearly polarized light into another linearly polarized light, mirrored by fast or slow axis. • The figure-2 depicts the same. 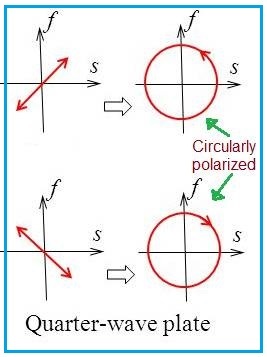 • It converts linearly polarized light into circularly polarized light, when input polarization is 45o to the fast and slow axis. The figure-2 depicts the same. • At other azimuth angles it converts linearly polarized light into an elliptically polarized light oriented along the fast and slow axis.